Looking for good clean fun for the kids this weekend? 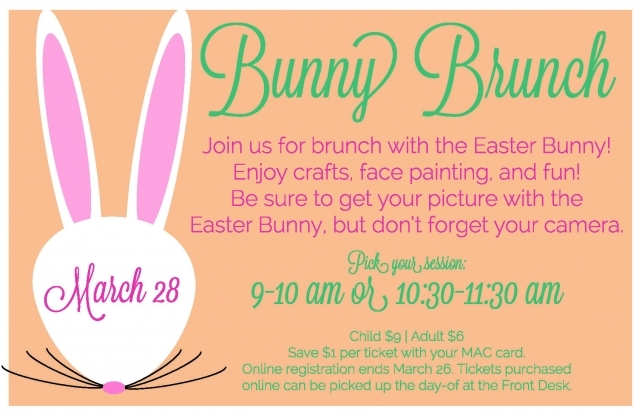 Look no further than Brunch with the Easter Bunny! 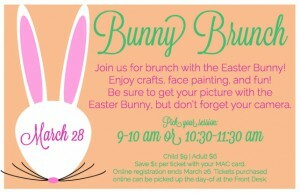 During your visit there will be face painting, crafts and pictures with the Easter Bunny! Don’t forget the camera! This entry was posted on Monday, February 9th, 2015 at 12:05 pm	and is filed under Events, News & Updates. You can follow any responses to this entry through the RSS 2.0 feed. Both comments and pings are currently closed.